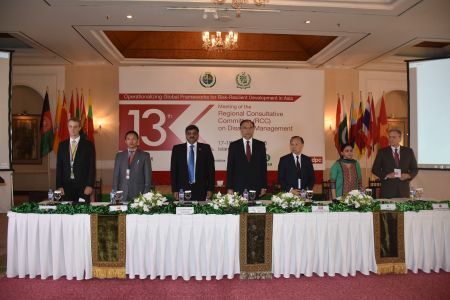 The 13th meeting for the RCC was held in Islamabad, Pakistan, in collaboration with the National Disaster Management Authority of Pakistan. The overarching theme for the 13th meeting was “Operationalizing Global Frameworks for Risk-Resilient Development in Asia”. 4. Establish synergies with regional initiatives such as the Heart of Asia mechanism, SAARC, and ASEAN to improve regional cooperation in disaster risk reduction, climate change adaptation and sustainable development at the national and local level. The meeting focused on four sub-themes, the first analyzing the Sendai Framework and member countries’ current experiences in implementing it. The second will unpack the other agreements and frameworks to see how they relate to disaster risk management and how they can assist in creating risk-resilient development. The third sub-theme will highlight how to operationalize the post 2015 agenda through partnerships and specific innovative tools. The fourth and final sub-theme will endeavor to bring synergy among various regional initiatives to strengthen and build capacities in disaster management and climate change adaptation collectively at a regional scale. The findings from the meeting shall feed into the AMCDRR, assisting countries in their understanding of the post-2015 agenda and implementation of disaster risk management. vi. Facilitate the application of disaster data management including disaster related statistics, as appropriate to, as the basis for progress monitoring and result reporting of SFDRR implementation. The RCC Secretariat greatfully acknowledges the kind support that the German Government has been providing in designing and organizing the RCC meetings since 2014 under the Global Initiative on Disaster Risk Management (GIDRM), and support from The Asia Foundation and Oxfam Pakistan for joining hands in organizing the 13th RCC meeting in Pakistan.